My aunt posted this on FB and I'm all about it! So pretty!! You sew together doilies to make a table runner! Very pretty. I've seen this done before but only in a solid color. I really like the variety of colors your aunt put together. She did such a beautiful job. Thank you for sharing. Hah, no she just shared it. I'm the only one who crochets in the family. 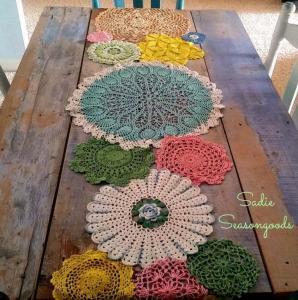 This blogger dyed some of the doilies before sewing them together because she thought all white was just too blah for this time of year.